My Dad is selling his Fathers 1903 St Louis, it has been in the family for over a hundred yrs. I have search through the internet to find information on this runabout built by George Dorris and only one page came up. 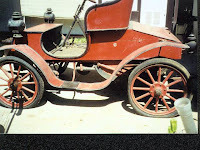 If you are interested in this 1903 St Louis, please email me and remember that this car has NOT been restored, it is in its orginal condition and due to aging the paint has cracked. My email is (teri432004@sbcglobal.net) I dont have any idea on a price to list this car of my Dads, if you can give me some ideas then email me. Thanks again !! !